A new survey commissioned by Grant’s Blended Whiskey has found that garden centres in the south east of England are reporting a 20 per cent growth in the sales of night-blooming plants. Seventy per cent of the 3000 people questioned said they liked to socialise in the garden after dark. The report also found that one in twenty gardeners work stark naked. There must be about twenty gardens in my street. I’m trying to work out who the one person is who gardens naked. I can let you know that it isn’t me. I don’t even like waring shorts when gardening. Trousers and long sleeves for me! Anyway Grants, who presumably want us all to start drinking its product whilst roaming our gardens naked at night has commissioned Chris Beardshaw to create three blue prints for the perfect ‘After Hours Garden’. As we’ve now got 24 hour drinking I’m not sure if there is an ‘After Hours’ any more but you can see the gardens for yourself at www.grantswhisky.com/gardenafterhours. I wrote a book three years ago called Curious Incidents in the Garden at Night-time, which you can see in the books section above so I’m really pleased there is renewed interest in the garden at night. As far as I know its still the only UK book that shows you how to select plants for the night-time. Let me know if there are any others. It’s also a story book and probably the book I am most proud to have written. www.allanshepherd.com/curious-incidents-in-the-garden-at-night-time/ Much as I hate to do myself out of much needed royalties you can get hold of a second hand copy for one penny plus £2.75 postage on Amazon at the moment. I have to tell myself that much more famous writers than I get sold for a penny too! http://www.amazon.co.uk/gp/offer-listing/1902175255/ref=sr_1_olp_1?ie=UTF8&s=gateway&qid=1212164804&sr=8-1. Alternatively if you don’t want to shop with a big corporation, you can get the book from www.cat.org.uk/shopping. There’s always a sense of adventure when ordering untreated, un-processed fresh from the wood timber. I needed some untreated chestnut fencing posts (chestnut doesn’t rot easily so lasts longer in the ground than any other UK wood apart from oak) and after several weeks of trying to track down a local supply (it felt like I was trying to buy something illicit) I found some being sold from a wood about three miles away. Absolutely perfect! Totally local! Practically zero carbon emissions. Just what I wanted. So I ordered 14 fence posts, gave instructions for the delivery team to leave them in my front yard and went away for the weekend…And when I got back I found not 14 fencing posts but what I can only describe as 14 nightmares. 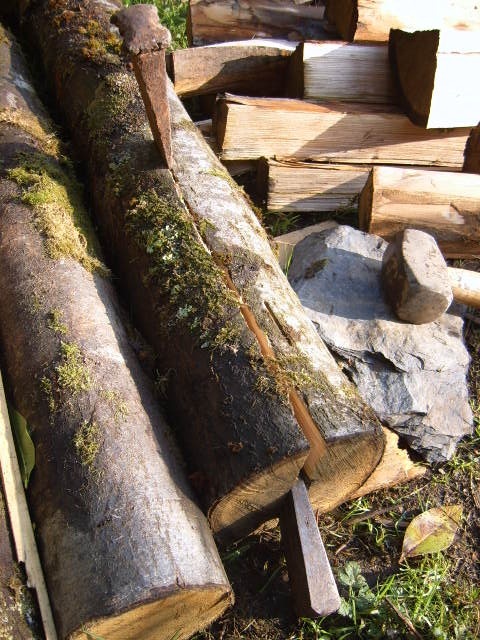 They had delivered me 14 felled trees, ranging from 20-30cm in diameter. Anyone who’s ever looked closely, or even not that closely will notice that the girth of a fence post is considerably smaller. “What the bloody hell am I going to do with those” I thought to myself as I imagined a burly Scot tossing these cabers over my house and into my back garden. To get anything up there I have to take it through the house, up the stairs, out the back door and then up the steep garden path. So I phone the man at the woodland. “Oh its fine, they’re dead easy to split”. “Right, and how do you do that?” After he explained I still didn’t understand. Luckily I was about to do the coppice craft course at CAT and I knew I’d find out. In the meantime my friend Emily came round with her chainsaw and we carried them up to the garden in 6ft and 3ft lenghts. I had to stay in bed the next day I was so bloody exhausted! Never mind my promise to carry only light things up to the garden! Anyway I learnt how to split the wood and its a total bonus. I now have far too much chestnut and I’m trying to work out what to do with it. I’ve got enough fence posts to do the whole garden, instead of just the small section I had planned to do. I’ve made a massive table and four giant seats. I’ll be making a giant cold frame, and I’m going to have to work out what to do with the rest. I’ll put the table pics up when I next have a moment but here’s how to split the wood. You’ll need three or four heavy metal wedges – at least one of which should be smaller than the others. Bob Shaw, our woodland teacher had a whole heavy hessian bag full of the things I could hardly lift. You can sometimes pick wedges up at car boot sales but they can also be bought from specialist suppliers and sometimes in local ironmongers. I doubt whether Focus don’t do it all will have them but you could see. Apart from that you just need a strong wooden mallet, a firm grip and a good eye. You could cheat and use a metal mallet and sledge hammer but in general its not good to hit metal on metal. 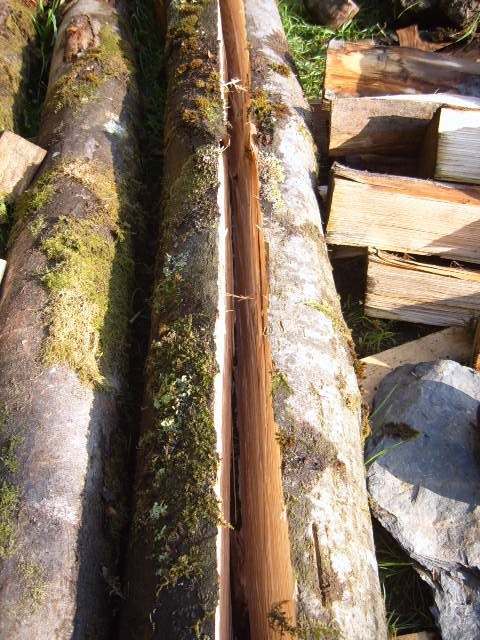 Some wood splits more easily than other wood. Willow for example twists when you split it. Ash and chestnut are good to split. That being said you still have to guide the split to avoid getting split drift which results in one half being thicker than the other. 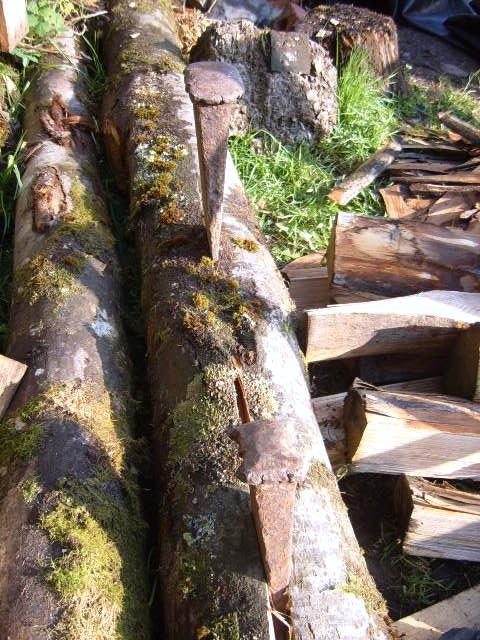 To split the wood in half you need to find the centre of the rings at the end of the wood. Place your smallest wedge dead centre and whack in with a mallet. It takes a few whacks to get it firmly set in the rings. Like so. Once you have hit it in far enough you will notice that the wood starts to crack in the centre of the ring and also on the top of the wood. 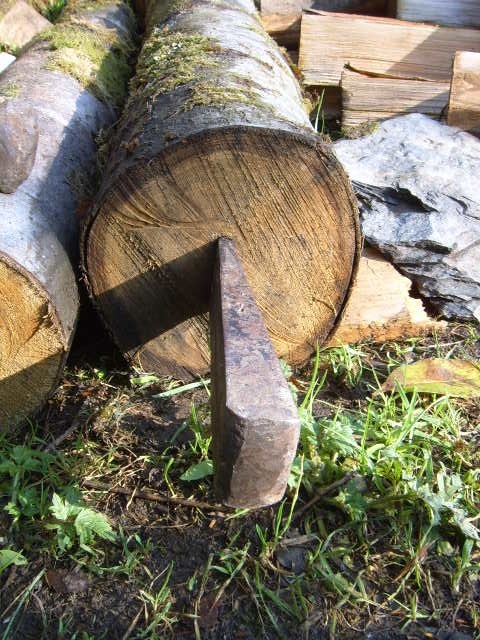 Once the crack is established you can place another wedge in the top crack running along the top of the wood. Like so. Bash this in and the split will continue beyond the wedge and along the wood. Sometimes you can split the wood with just this one wedge positioning but on a longer piece of wood you will have to carry on placing wedges further along the split, guiding it and making sure you don’t get split drift. Like so. Wood seems to split easier once its been seasoned for a few months. I got this delivery back in the winter and split some then when the wood was still quite green. The splits were hard won. Now the splits come more easily. Also get a good set of wedges. I borrowed these from my friend Grace and she got them second hand a bit worse for ware. They should be well pointed and have good firm heads. It took about five minutes to split this wood. After splitting it into half I did the same again, splitting it into quarters. This was much easier. 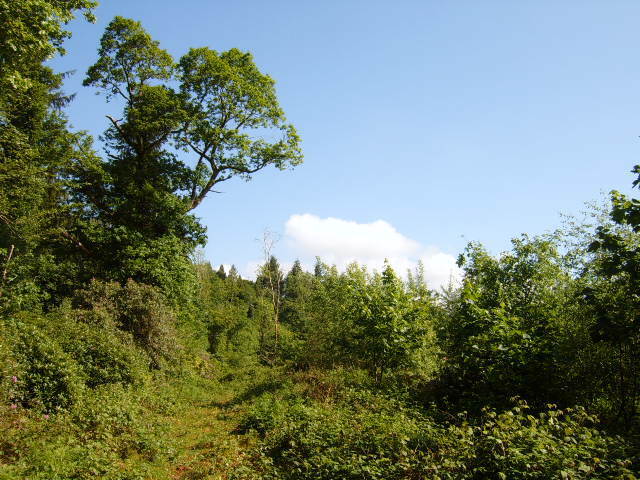 Yesterday Grace took a few us round the wood from whence my chestnut came, as part of it has been bought by The Centre for Alternative Technology to manage for biodiversity and woodland products and to teach courses. It’s great to see where my wood came from. As you can see it’s a really beautiful spot. CAT will be running a new course next week, the first of its kind in the UK. It’s called Gardening for A Sustainable Future and will combine CAT’s unique blend of horticultural and environmental expertise. The course will look at gardening in relation to the issues of biodiversity and climate change, how they affect us as gardeners and what we can do to make positive changes within our gardens and for the wider world. Yalding Organic Garden re-opens: but is it as good? Yalding Organic Gardens has re-opened for business under new ownership after being dumped by Garden Organic following a financial review earlier in the year. The campaign group set up to save the gardens has posted a mixed review of the facilities which you can see at http://yaldingorganicgardens.info/drupal/node/24 but they’re keeping an open mind and were very pleased to see that the gardens have not suffered unduly. If you’re in the area go along and support Yalding. Whatever you think of the closure process its important to give these beautiful organic gardens a future. It almost seems like one of the stereotypical greenie knit your own yoghurt pots moments but you can now get slug pellets made out of wool. Recycled wool no less. Strange but true. Made by Kindtoo there perhaps somewhat miss titled Slug Buggers expands when wet into a wough wooly carpet with small needle-like fibres slugs wont cross. I guess its the same sort of theory that persuades countless gardeners to mount barriers of egg and nut shells, pine needles and other rough surfaces around their plants. I haven’t seen any positive or negative comments about the product as its only just out but if anyone buggers their slugs this year please let us know! Kindtoo managing director Eric Graham says they’re “easy to use and extremely effective at deterring slugs” so lets put him to the test. A 3.5 litre bucket costs £9.95. To order telephone 0845 8623888. www.kindtoo.com. Actually I’ve hardly seen a slug this year. Its very dry so they’re all hiding away from the veg patch which I’ve kept totally weed free. 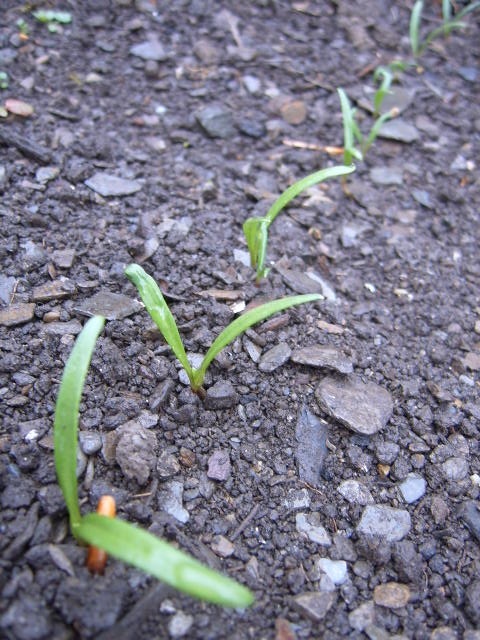 Slugs love to hide when its hot and dry and will make the most of any clumps of weeds you’ve neglected to pull out. First rule of slug control is to keep your beds free of weeds and keep hoeing regularly to disturb any eggs and break up the slug trails they use to go back to their targets. However if we get any rains at all they’ll make the most of it and will be out looking for something young and tender. Traditionally many barriers fail when they get wet. Some will wash away. Some are easier to cross when wet. So if the expanding slug buggers work when wet it could make a lot of sense to use them just when you think they’re might be a damp patch coming up. You’ll have to go out in the evening or at night with a torch to see how effective they are. Slugs love coming out in moist conditions at the end of the day. After spending much of the winter tidying, digging, building, fencing and preparing its great to finally have my first seedlings coming up. This snap will also give you a good idea of what sort of soil I’m working with. I put compost on every year but no amount of compost will change the basic soil type, which is slaty. It almost seems a miracle anything comes through at all! Compost Lover had nearly 1500 visitors last month (the most in one month so far) so thanks to all who made the call. You seem to be liking the how to make a dry stone wall blog, the low carbon garden – wattle blog and the bean pole archway blog the most so I’ll keep putting up practical stuff and mixing it with the news stories as I go. I’m making a garden table out of some chestnut and oak at the moment. It’s going to be big. Like a giants table looking over my Welsh valley, with big rustic stools to sit on. I’m not great at carpentry but I’ll put a blog up about how to make a basic table using untreated durable timber and let you find your own way to someone more skilled if you feel inspired. Tomorrow I’m at the Royal Agricultural Showgrounds in Builth Wells at the Smallholding Show. It’s a great show with loads of opportunity to buy local and get coppiced products and information and advice too. There’s usually a fantastic tool stall there too so I’ll be there looking for something old and unusual – and I don’t mean the people behind the counter. So thanks for visiting and keep coming back.